For rate information call 805-546-8208 or E-mail Rachelle Ramirez. Fictitious Business Statements $58 (one name, one owner). Each week, 37,000 copies of New Times are distributed throughout San Luis Obispo County and northern Santa Barbara County at over 950 pickup points. We keep a sharp eye out for new locations and monitor every pick-up point like a mama bird keeping watch on her brood. When demographics and population patterns shift, so do we. But we don't do it alone. We work closely with Verified Audit Circulation, one of the nation's premiere newspaper auditing services. 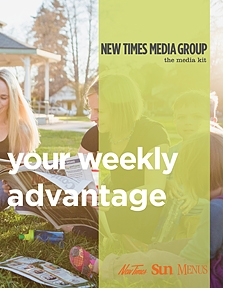 You'll find New Times maintains controlled placement in outdoor racks and boxes, at hotels and motels, retail stores, banks, shopping centers, restaurants, and nightclubs. New Times is an award-winning newspaper. New Times online reaches readers all over town and even around the world. Its easy-to-navigate interface, event listings, and cover story archives combined with 24-hour-accessibility make the site a hit with a growing audience of online readers. Updated weekly with new cover story, listings, helpful local information and popular columns, New Times is earning repeat visitors as one of San Luis Obispo most read web sites. Call for online advertising rates: 805-546-8208. E-mail advertising@newtimesslo.com.